We had a great time at the Oakland Children's Fairyland's 17th annual gala and dinner. Don't know about Fairyland? It's this incredible children's theme park nestled up next to Lake Merritt in Oakland, CA. It's been there since 1948, and it's rumored to have been a major inspiration for Walt Disney's theme parks. The rides and the art that went into creating its storybook themed environment are incredibly cute and inventive, and it's still going strong. Generations of San Francisco Bay Area kids have had good times there! Walking through, you can feel all the happy that's happened in this special place. Normally, you can't enter Fairyland without a child in tow, and not having any, we were lucky to be able to get in for a rare look around once years ago when our good friends Dave and Simone rented it out for their wedding. It was a spectacular party in a magical atmosphere, and I've loved Fairyland ever since and have just been *waiting* for the chance to go back. Fairyland occasionally holds evening parties for adults, but they're so popular that tickets sell out instantly! 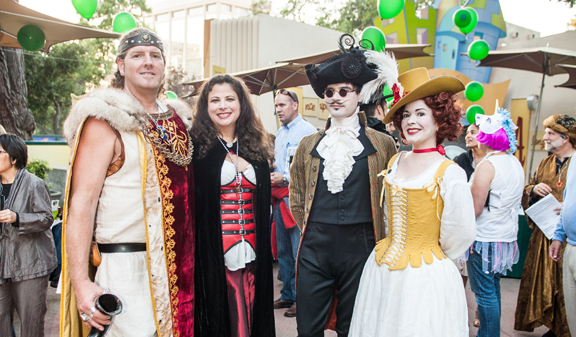 The gala was attended by over 500 guests, most in costume, and catered by dozens of incredible local restaurants. There was fantastic music, dancing, and we ran into a bunch of old friends, not all of whom had met before. They each have their own totally cool projects and interests, so we were excited to make introductions and I'm hoping many fruitful collaborations result. All around, a fantastic evening. Want to see more photos of the gala? Click here.